Disneyland helped transform the entertainment industry worldwide. 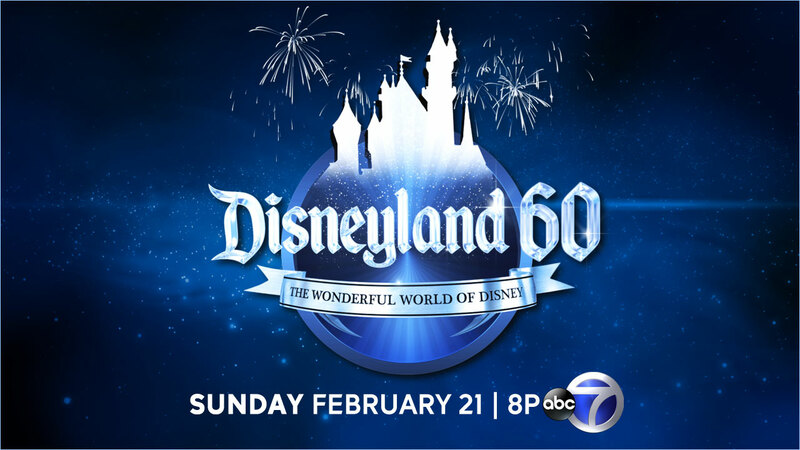 On Sunday, February 21 at 8 p.m., ABC7 will air "The Wonderful World of Disney: Disneyland 60," celebrating 60 years since Walt Disney first opened the gates to Disneyland. Walt Disney, one of the ultimate dreamers, used his uninhibited imagination and determination to create what became the springboard for all of the Walt Disney Company's spirited and wildly successful creativity that followed -- his crowning achievement: Disneyland. ABC will celebrate the inventiveness and inspiration of Disney's big, bold creation with a glamorous, star-studded Diamond Anniversary event, both in the heart of Hollywood at the Dolby Theater and throughout some of the most iconic locations at Disneyland Park, including Sleeping Beauty Castle and Main Street U.S.A., and Cars Land, a themed area of Disney California Adventure Park. The special will also showcase two dazzling displays of technology - the "Paint the Night" Parade and "World of Color-Celebrate! The Wonderful World of Walt Disney" in Disney California Adventure Park, along with many more, on "The Wonderful World of Disney: Disneyland 60." One of the most successful solo artists of all time, Sir Elton John will perform two sensational songs on "The Wonderful World of Disney: Disneyland 60." Despite meticulous planning, Disneyland's opening day did not go off without a hitch. What was intended to be an invitation only affair with an expected crowd of 15,000 became much busier when thousands of people successfully entered the park with counterfeit tickets. Furthermore, the park also ran out of food and the hot weather caused the pavement to melt-a problem for guests wearing high heels. Even with attendees such as Ronald Reagan and the Governor of California, Disneyland was not the happiest place on earth. Fortunately, Disneyland was quickly able to improve and fix these existing problems. Within 7 weeks, over 1 million guests had passed through the gates. Who's Behind "It's a Small World"? Though many people can't stand the song, "It's a Small World" was actually written with good intentions. Written by the brothers Richard and Robert Sherman, it was meant to give people hope after the Cuban Missile Crisis. If you don't claim much more in their songwriting catalog, though. Fortunately, if you don't care for "It's a Small World," chances are there are many other songs that the Sherman brothers wrote that you do enjoy. In fact, they wrote the scores to Mary Poppins and Chitty Chitty Bang Bang and won two Academy Awards. Walt Disney never said, "If you can dream it, you can do it," but even if he had, most potential Disneyland investors wouldn't have agreed anyway. Before opening Disneyland, most people viewed the park as a terrible financial risk and chose not to give any money to the project. However, one company did come to the rescue: ABC. In a special agreement, Walt Disney agreed to create a TV series for the network if they would give him the money he needed to fund the park. The program was watched by millions and garnered extensive coverage for Disneyland. Today, the tables have turned and Disney now owns ABC. Disneyland isn't all about profits; the park has a history of extensive nonprofit work. Notably, since 1957, Disneyland started the Community Service Awards, which have contributed millions of dollars to community service.